In nearly every nutrition seminar I have been to recently ‘bone broth’ or stock is being recommended for its nutritional properties, to help with healing of the gut lining and many other conditions. This hot drink / base for soups is rich in gelatine, a good source of the amino acids, glycine and proline, as well as many other constituents, such as glycosaminoglycans (GAGs) that are said to be nourishing for our body tissues such as collagen, connective tissue and cartilage. Underground Wellness – Sean Croxton says he has ‘quite the man crush’ on the rich brown liquid that now fills his coffee cup each morning. Of course the best thing to do is to make your own broth from scratch. The video link above shows Sarah, from the Weston A Price Foundation, demonstrating how to make a broth from a whole chicken. Please do try this out, especially if the process feels a little unfamiliar or strange for you. However I find the time involved in making this broth from scratch, letting it gently simmer for 24 hours, limits the amount of times people actually get around to making it. It you want to start drinking it every day it can feel like a weekly chore that never gets done. That is a shame! 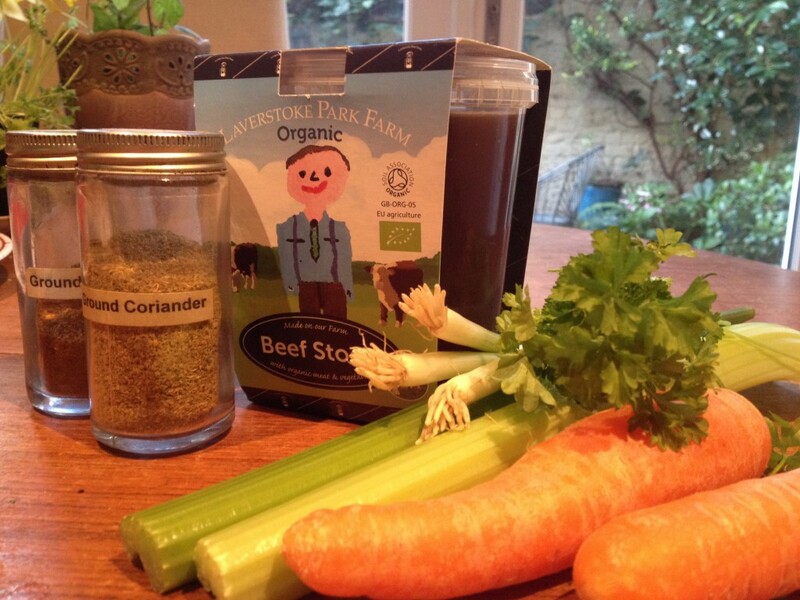 Last year I was introduced to the idea of using ready made stocks for bone broth by Lorraine Nicolle, co-author of ‘The Functional Nutrition Cookbook’. I didn’t even know these fresh stocks existed in the supermarket as I was brought up on stock cubes, but there they were, in the fridge by the fresh meat, just waiting to be made into creative broths. Try out the beef, chicken or fish stocks available. Make sure that they are gluten free (and onion free if following a low fodmap elimination plan). Go for the fresh versions, in the fridge and go for organic wherever possible. You can add them straight to soup recipes or try out the recipe below for a tasty hot drink. I like to heat this up as soon as I get home, and have it like a starter, while I am preparing dinner. I love drinking it from a rustic, brown mug and getting into cozy home-time mode. Place all of the ingredients into a large pan, bring to the boil and gently simmer for ten to fifteen minutes. Alternatively allow to cool, then divide up into individual containers and freeze until needed. 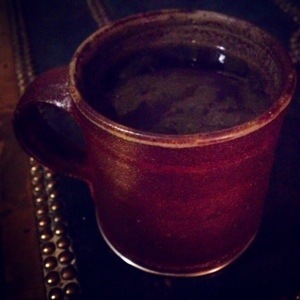 This entry was posted in Front Page, Uncategorized and tagged Drinks, Intestinal Permeability, Paleo, Recipes. Bookmark the permalink.